Before you go to our top picks for the best training collars for dogs with in-depth reviews and pictures, please make sure you read our informative guidelines first on why, or more appropriately put, in which case you need a training collar and how to find the most suitable one for your fella. Okay, here’s the deal – training dog collars are not appropriate or necessary for everyone. As for good or bad influence, again, it all depends on the necessity AND how you use them – if used correctly, no harm shall come to your dear companion and only valuable things can be taught, whereas if used inappropriately – may even affect dog’s behavior for the worst. First, you have to understand that these shock collars are not meant as a punishment. but as a deterrent to change a negative or unsafe behavior in a dog. There’s literally no lasting physical harm if you use a properly set training collar available in the market. In fact, the best shock collars will administer a beep (or a vibration) as a warning before the dog receives the actual shock giving you a time to give the necessary command orally (for instance, if the dog is getting out of the allowed area or your backyard). The first key question in understanding whether your dog specifically needs one of these devices is the following: is your dog old enough to understand what the correction is being given for? Basically, we need to assess whether the dog is developed enough mentally – does it understand what behavior is causing the correction from this device. Before using these dog training collars, we have to ensure our four-legged companion is capable of associating the negative stimulation of the collar and the activity we are trying to stop. Do you live in a private house with a backyard? Is your dog often unleashed in either backyard or public places? Is your dog well trained and obedient already? Now, even if the answer is a “yes” to not just the first and the second question but also the third, you might still consider a training collar as dogs are still instinctive animals and might misbehave in certain situations given the “right” circumstances. You might also consider a training/shock collar in cases of excessive barking and food aggression (resource guarding). The bottom line is, as long as you have a clear purpose and aim for a training collar, it should be regarded as a positive improvement and deterrent tool, preferably, not for a lifetime but only for the adaptation and training period. One important aspect of this kind of training and correction – you have to reward your dog for good behavior (a treat, an expression of affection, or some playtime together are some good options). Flexible: can be set on a warning beep or vibration mode, and adjustable settings on the levels of shock Over-correcting: By this, we mean both in your presence and especially when your absent as the collar may deliver shocks too often or unintentionally, and that in some cases may confuse the dog even more. An appropriate setting is a must. HM tip: Apart from our previous key point outlined above, we actually do suggest a consultation with a professional dog trainer in case of a temperamental dog showing signs of aggression. It wouldn’t hurt for a professional to see your individual before determining whether such device would be suitable. What to look for in a training (shock) collar for my dog? This lightweight SportDOG model is excellent for dogs who are better off with just a vibration, beep, or a low stimulation of shock as the 7 levels in it only go up to a medium power of stimulation (if you trust the brand, they offer another model for more stubborn dogs that otherwise has the same features except for the power of shock: SportDOG Brand FieldTrainer 425S – For Stubborn Dogs). Beware, however, that even though it’s a low/medium stimulation, this dog training device isn’t suitable for dogs under 10 pounds. The 500-yard range is solid (though in reality the signal might be lost after 400), the rechargeable battery is pretty strong, and the device is also waterproof (in up to 20-25 feet of water). It’s also a fantastic offer for households with more than just one dog as the device can be used for up to 3 dogs (you just obviously have to get two more collars for the other 2 dogs). In addition to the main product, you get a training DVD and manual. It also comes with a 1-year warranty. HM tip: Go for this modern lightweight device if 1) you have a multiple dog household, 2) your dogs aren’t the most stubborn ones who wouldn’t pay attention to a small shock or vibration (for that, consider SportDOG Brand FieldTrainer 425S – For Stubborn Dogs). Dogtra ARC training device can be used for up to 2 dogs, and the collar is adjustable to a wide range of dog neck’s sizes. Just like the other best shock collars in the list, in addition to shock, the device offers the vibration-only option if the shock isn’t necessary. However, it’s used, it can be adjusted incredibly, as the device offers 127 (!) levels of shock stimulation (you can see the level on the built-in LCD screen). However, it still might not be enough for a more aggressive dog (in such case, consider our alternative for our pick No. 1 as this one is intended for dogs with softer temperaments). A great thing about this device is its range it can be used in – 3/4 of a mile, and it’s also rechargeable in under two hours. Overall, it’s a great quality product with a 1 year warranty, and the manufacturer has made it in a discrete manner that nobody will notice you are using such device (as you may know, there’s a fair portion of people who disapprove these training collars), yet, there’s no additional training material, and it feels just a little bit overpriced. HM tip: Consider this modern device an excellent choice if 1) you have two medium to large breed dogs, 2) they are rather soft than aggressive in temperament. Dogtra IQ Remote Trainer also offers many more levels of stimulus (shock) levels (100!) than our pick No. 1 but can be used for one dog at a time only. The 400-yard the manufacturer promises seem to be true, therefore, making a tie with our pick No. 1 in this regard but losing to our pick No. 2. The good thing about this device is its solid battery life, and it can be recharged in under 2 hours. We have to say, though, Dogtra IQ Remote Trainer is designed to fit best on smaller breeds that weight at least 10 pounds, therefore, for more some larger and more aggressive breeds we wouldn’t recommend it as much. Just like our other top two picks, this product has a 1-year warranty. HM tip: Consider this one of the best dog shock collars if you have a small breed dog (and only one). The features and overall quality are really satisfying in such case but it wouldn’t be the best investment for a larger breed (and obviously not for multiple dogs). Pet Resolve Dog Training Collar is a very adjustable dog shock training collar as it for both larger and smaller breeds (starting at 15 lbs). Just like any decent training collar, it has also vibration and beep mode meaning that the use of shock isn’t always necessary. It’s one of the best in terms of range – 3/4 miles. Another great advantage over most other pet training collar devices in the market is that this one can be used for up to 3 dogs simultaneously, and it is also waterproof. The company issues a 2-year warranty which is actually more than most others. In addition, you get a free e-book. The main drawback we found was its battery life – it dies sooner than other devices in the list. 10 levels of shock also aren’t much but it’s more about the efficiency, and, overall, it is quite satisfying in this regard. HM tip: Consider this a bit less expensive counterpart to our pick No. 1 for 3 dogs, and an excellent choice for long-distance training as it surpasses our first pick in this regard. This brings us to the best budget dog training collar – Petrainer Dog Electronic Collar (PET998DBB). In fact, it matches up to our other best picks for the most part – it’s waterproof, offers beep and vibration-only modes as well, AND can be used for up to 2 dogs. 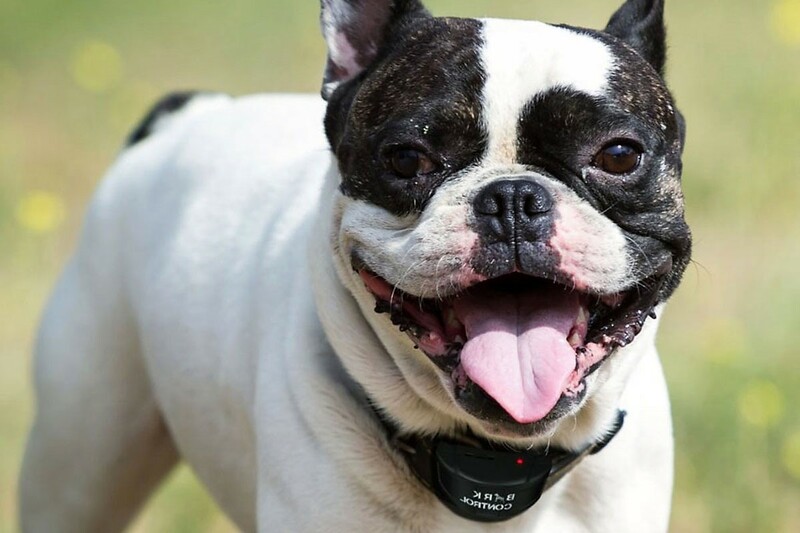 What’s even more impressing, Petrainer Dog Electronic Collar offers 5-year Replacement or Refund Warranty. Similarly to its more expensive counterparts, Petrainer offers 100 levels of adjustable stimulation, and the collar suits different-sized breeds (15 lbs and up). The only drawback we found that it works up to 330 yards, maybe even less. While that might be completely satisfying for some, it doesn’t match up to the greatest expectations. Also, it’s not as durable as our other picks but, if used properly, shouldn’t cause any worries. The rechargeable batteries are also okay. Overall, because of the great (for the most part) features it possesses, this device can be regarded as the best budget dog training collar. HM tip: Consider this the best value-for-price dog training device in the market – it has many great features (suitable for 2 dogs, waterproof, etc.) that will work perfectly for most pet owners. It has its drawbacks (see above) but if those are not an issue for you, we highly recommend this budget variant. So, there you go – our top 5 choices for the best dog training collars. Now, you can find some even more “serious” hunting devices that might be more suitable for certain occasions for professionals hunters but most of these are also satisfying in that regard. Besides, our article, obviously, was mostly intended for general public. As outlined above, you do you to take several considerations into account before purchasing the most suitable device for your individual companion (or companions), therefore, know the measurements and the temperament of your dog, as well as your whereabouts and daily routine. A lot of times, the “shock therapy” is necessary only once, therefore, even if you look for another training collar, remember that a beep/vibration mode is an essential feature to have. Otherwise, it might take more attempts (at the right moment, i.e., at the moment of the bad behavior) or adjusted level of power used. Anyhow, we’d suggest consulting with a professional dog trainer and/or a vet before purchasing any kind of shock collar for your dog. If you have any questions, don’t hesitate to reach us by mail or comment here. Dog Feeding Schedule – Should I do it and if so, how? HMtip is a veterinary based website run by professionals with the main goal to give you an insightful advice and guidance on your pet’s nutrition, grooming, accessories and overall happiness.